Quick update for the latest chemo round. We got really good news on Tuesday. I had a CT scan of my lungs which showed tumor shrinkage! Jenn and I had been expecting that, but of course were anxious for this news for a while. Basically it means the chemo is working and we will continue with the current protocol until the tumors stop responding. So it’s two more 3 day rounds of chemo for me which started Tuesday. After this round, wait 3 weeks then another. 3 more weeks then another CT scan to see how it’s all working. Our oncologist was pleased with the results, which is really encouraging. So now, I’m getting my last day of chemo for the week and will wait out the usual post chemo blues in bed over the weekend. This round so far has been much less taxing than the last couple – mostly due to less leg pain and no more double vision. Next week we have our next prosthetic appointment which hopefully will also be full of progress. I’ll write more after that. Please keep the prayers and thoughts coming. They are always appreciated. Have a good weekend! There has been a little news since last week’s post. Two significant events have transpired over the last few weeks: 1) my double vision has continually improved to where I think I’m back to normal and 2) the phantom pains in Short Round have diminished to pretty much nil too. Now that the double vision has subsided (it lasted for about six weeks), I am fully realizing the impact that it was having on my daily routine. I couldn’t focus on conversations with people without thinking about which head I was seeing. It affected my balance too and I couldn’t scoot around the house on crutches very easily. When my oncologist realized how bad it was, she ordered an MRI of my brain to ensure that particular organ was clear of any tumors (synovial sarcomas rarely spread to the brain). Many of you know my feelings on MRIs – can’t get enough of ‘em!!! This one was scheduled for Friday, January 11th…at 6:30 AM! So we took the boys in, scanned my brain, had breakfast, dropped Ben back at school and enjoyed the rest of our day. The doctor called that Friday night to tell us that my brain was clear of any tumors (whoo hoo! ), but that a tumor was found on part of my skull bone, near some optic nerve bundles. She said the tumor itself was not concerning, but that it could be pressing on the nerves and ultimately causing the double vision. Unfortunately, like most of them so far, the MRI was not complete enough to make that determination. It was like someone had taken a family photo, but had cut off Grandad on the side! What then? Another brain MRI! This one was scheduled for last Friday (18th) at 7:00 AM. Nothing can ever be easy! But I will say that, in my limited MRI experience, brain MRIs are much more tolerable than leg ones. My head was the only part of my body inside the machine, and just mentally knowing I could move my legs if needed was enough to keep me still for an hour. I do feel for folks who are claustrophobic though. Not a pleasant experience. Throughout all this, as I mentioned, my vision improved drastically. I believe it was the chemo working and reducing the skull tumor, which is positive news. My doctor called us today with the results of the second MRI and once I informed her how drastically my vision improved, she agreed with me. The second MRI showed the skull tumor near the nerves, but they were not pressing on them. The next steps for the vision problems are to just monitor and if it gets worse, radiation is a possibility. Luckily, she said that radiation treatment to this part of the skull is pretty routine. I’m just glad now I can see that I have two children instead of four. She also told us that if my lung lesions have stabilized or shrunk based on the results of my next CT scan (January 26th), we will have at least 2 more chemo rounds. That’s good news too. It’s aggressive and now that my vision is improved and Short Round is cooperating, chemo shouldn’t be too bad now. We know what to expect and it gives us a good timeline for the next couple of months. If for some reason, the tumors have grown (which based on my improving symptoms over the past couple of months, I don’t think has occurred; but I don’t want to jinx anything by keeping it a secret! ), we will discuss other treatments. Having the chemo treatments over the holidays, winter weather, and just giving my leg time to heal has really given me a case of cabin fever. So the last week, given how good I’ve been feeling after the last chemo round, Jenn and I have gotten out of the house on a couple of occasions. We had lunch last week at Red Robin and I thoroughly enjoyed their Burnin’ Love burger, which surprisingly lit my tongue on fire! And yesterday we had lunch with my lab at Mellow Mushroom. Chemo and lying around waiting for an amputation to heal has made me really appreciate eating good food more and more. I’m always hungry lately (probably because of the steroids I’m on; watch out Lance!) and most foods that were once just okay, now seem to come alive in my mouth and do a dance of delight! I’ve never been interested in food television shows, but I can’t seem to get enough of Diners, Drive-In’s, and Dives lately. I want to eat everything on that show! We also did some shopping at Sam’s Club with Jack and, yes, I rode in the old people’s handicap cart! It was fun. It goes surprisingly fast and has a turn radius that puts any performance car to shame. It’s been really good to get back into the world after a couple of months away – something that I will appreciate just a little more now. As always, thanks for reading. I realize the posts are getting less and less medically dramatic, which is good for us! Hopefully, we will continue this path and I can write more about eating and prosthetics! After my last post, I was struck by the resolve that my children are showing through all this and wanted to write a little more. The chemo sometimes makes my head spin and even just turning my neck in bed makes me dizzy. And it (and certainly some of the other drugs I’m taking) also makes me emotionally unstable. Whatever. All I know is sometimes I’ll be sitting just watching TV and I’ll just have an emotional low. It’s like sitting in the ocean and being surprised when waves crash over your head. You know they are there, and are headed your way, but for some reason, it’s still unexpected. And that’s not me. Most folks who know me know I’m pretty stable. Monday was interesting though and after some reflection, I thought I should be mindful of what was happening and share it. It was raining outside, very heavily. I was watching television in bed while the rest of the family was doing other things in other areas of the house; nothing out of the ordinary lately. All of a sudden, I felt an emotional low starting to loom over me; a slow moving wave with a high crest that I could almost physically observe out of the dreary window. Most of the time, I can just deal with it, recognize it for a low caused by medicine and fatigue and distract myself with the internet, books or anything else and it will pass. But this time, even though my family was home, I realized I just needed someone close to me – a family member within an arm’s length. Jenn was watching Jack and Ben was in his room. I asked Ben to come in and keep me company. I had been in bed a long time and with the rain, and the drugs, compounded with the looming wave, I needed my son. And without complaint, he came. He sat in bed with me, just being with me. At that moment, he didn’t understand how much I needed him but that did not matter. He certainly doesn’t understand the full ramifications of what may happen with this cancer, but right now, he doesn’t have to. I imagine he does understand at some basic level that his daddy needs him right now as much as he needs his daddy. And that is enough. I hope that is one of the positive lessons he takes away from this. That cheering up a really sick dad, while it shouldn’t be a part of any 6 year old’s life, is the reality right now. And he’s good at it. He’s empathetic, considerate, cheerful, and kind and I am so proud of him. He has been busy making crafts for me including a UFO with alien. And he’s made me a personal notebook with his own paper that I can draw or write in with crayons and pencils attached by a Ziploc bag. When he brings me something he has created, I can see the pride in his eyes that indicates how much thought he has put into his version of what will make dad a little happier. Seeing that look warms my heart. He keeps me company through this and I will be forever appreciative. I look at him, and Jack and Jenn and can’t help but be overwhelmed with their presence through this. I watch them play; I smile and laugh with them, then realize how much this disease is affecting me as I lose my bearings because I’m dizzy or tired. But they keep me company, and sit in bed with me and keep the house alive with child’s laughter and innocence. And that gives me strength, courage, and motivation to keep going and not give up. This is hard, but the boys are making it just a little easier. And we are so fortunate to have that support system within an arm’s reach. My latest prosthetic appointment was yesterday. Lately, we have been in kind of a stagnant mode regarding the prosthetic. Through all this, my being autonomously mobile is the one area that gives us tangible hope and a sense of progress so getting back on track has been at the forefront of our minds. I had been waiting for a small part of my incision to completely close until I could get fitted for my silicon liner. The chemo had been slowing that process. We had last seen our awesome prosthetist prior to Christmas and he wanted to wait longer to fit me for the liner until the incision had more time to heal. By yesterday, the incision, while significantly much better than our first visit, still had not completely closed. There was (still is) a minute amount of drainage. So before the visit, we were anxious that we would have to wait even longer for prosthetic progress to continue. To add to the uneasiness, we had had to shift our appointment once already and certainly did not want to continue just showing up and having the prosthetist tell us to keep coming back! 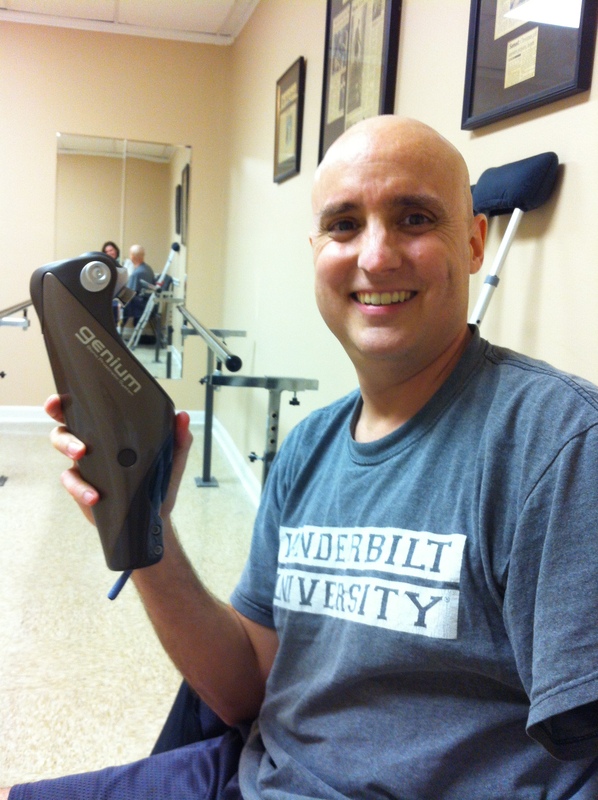 We drove to our appointment (30 min drive to Nashville) and waited for our prosthetist. Once he came in, I rehashed what our last appointment had been, and he began the examination of my wound. He looked, pushed, squeezed, rubbed, and worked Short Round. Much to my chagrin, a small amount of discharge appeared in the one messy spot…grrr… Fortunately, it wasn’t enough to warrant another visit. He was satisfied that it was a small amount and he would go ahead and fit me for my liner! In my head I was doing backflips! So he went and got the silicon liner, cut it to fit, and proceeded to work it onto Short Round. There was a little bit of pain, but I was welcoming of it! Once it was on, he had me stand and he wrapped a fiberglass cast around the liner, which will be used to cast the actual socket…more signs of mobile progress! I’ll wear the liner for two weeks and we’ll go back to get the socket fitted. That visit may also include attachment of the actual leg portion. To top off the exciting visit, I held the actual leg in my hand (see photos) – a small measure of forward motion! We are just ecstatic to get things stepping out on the leg front! Using suction, the liner holds the socket in place once the leg is attached. The white rings at the bottom help create a more secure fit for the socket. We’re 99% sure we are getting the Genium over the C-Leg. Until it’s affixed to me, I’m not going to jinx it! As always, thanks for reading everyone! Your post responses continue to inspire and encourage us. They are consistently a part of our daily conversations. Please continue keeping us in your prayers and thoughts. Until the next update, talk to you later! Just a quick update after this week’s chemo. Last time I was sick on the second day. Fortunately, it didn’t happen this go around. Still the same fatigue and lethargy as usual, but if any nausea can be avoided, I’ll take all the others annoyances. We’ll get a CT scan in 3 weeks to see how the treatment is working. Now I’m sitting with Ben, letting the toxic drugs do their magic. Yesterday (Saturday after treatment) seemed like the worst day last time and that still rings true. The taste in my mouth was horribe and it’s finally dissapated. Every action requires an invested effort and is extremely tiring. I’m pretty much reading and just enjoying being around the family as much as possible. I have energy laying in bed, but when something requires my attention, I can really feel it. Jenn is tirelessly and graciously waiting on me, hopefully for the last time! We are looking forward to Downton Abbey tonight. I hope everyone is doing well. More to follow after next week’s appointments. Thanks for reading! My docs are adjusting some of my meds that may be contributing. Just another example of how cancer attempts to needle with the “small” stuff while battling the big. After chemo rounds, there are a few days when low white blood cell counts do not allow for much human contact or closeness due to risk of infection. Our bedroom is pretty much isolated from the rest of the house and we have a “biohazard” line that the kids can’t cross! I feel like the bubble boy on Seinfeld. It’s pretty much lay in bed all day, feeling sorry for myself being waited on hand and foot (ha ha) by Jenn. Once I start feeling better though, I can reconnect with my family and be a dad. Such was the case this morning. Jenn was resting (much needed lately for her!) and Jack needed a diaper change, which I hadn’t done since the biopsy in October. I was able to successfully change him without Jenn having to get up from her nap. I realized that I actually missed changing him which I never thought I would. Ask me again tomorrow and I may have a different answer! At home, things have been quiet. My family left last Saturday after helping out over the holidays. Ben went back to school this week and related to the above story, Jack has been successfully potty training (whoo hoo)! With my vision problems, he’s better at hitting his target than me! Next week is another long one though. Having cancer is like a full time job. Monday morning starts with a physical therapy appointment, and then in the afternoon, we see the prosthetist who will hopefully assess Short Round for a socket fitting. Tuesday through Thursday is the same chemo schedule as in December – 6 to 8 hour infusions each day. While not looking forward to it, at least we know what unpleasantness to expect this time around! Not sure what happens after this round – I think we’ll do another CT scan 3 weeks after to determine effectiveness, but my doc may decide on another round. Overall, not just now, I feel good. The chemo knocks me down, but (again not to jinx anything) I feel like it is working and that keeps me going. 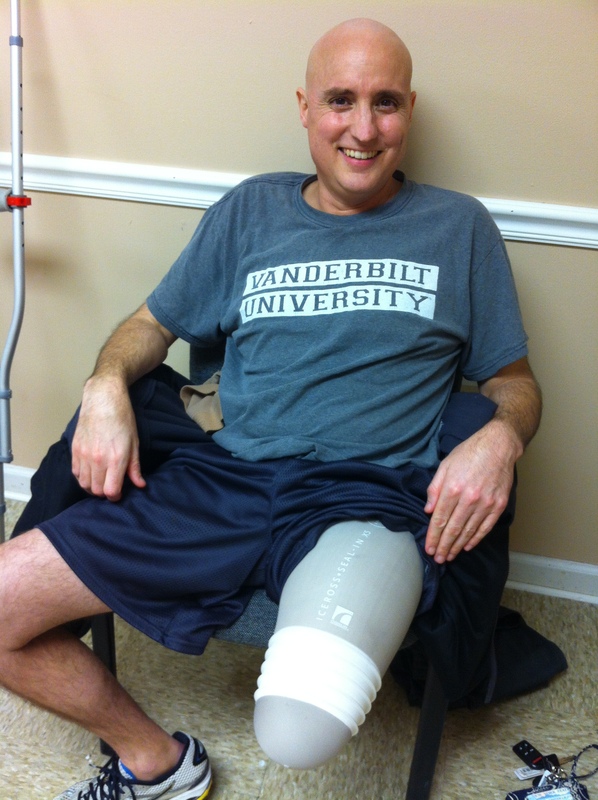 And, while not always successful, I try to keep in mind what many cancer patients have been through before me, significantly more rounds of chemo, surgery and then radiation to boot; I feel like I don’t have a leg to stand on (ha ha, again!). My symptoms seem to be diminishing. My lungs feel good and I haven’t had any more issues with my right leg. I’m hopeful that the treatments are working and we can either continue them, or finish this for a while. Once I’m more mobile (read, new leg!) I’m anxious to get back into the lab and get back to work. I miss being around science and working on my research. I miss thinking about how my data is contributing to the bigger picture. I hope everyone had a good rest of their holiday and is enjoying their new year.